I was really looking forward to a devotional book for my kids, they love Bible stories and it would be nice to have an aid to apply the themes behind the stories. I have to be honest, I was a little disappointed when I received this book in the mail. Not because the content was bad, but simply because my kids seem to be a little to young to benefit from the book. My oldest is 6 years old and I was hoping there would be some pictures to go with the stories. and colour, but this book does not provide either. Also the book refers time to time to the Adventures in Odyssey characters and stories, and my kids have not seen either. All my personal disappointment aside (not being able to put it to use right away), I thought the devotionals were great when geared toward older kids. The stories are short enough, engaging, and Bible based. 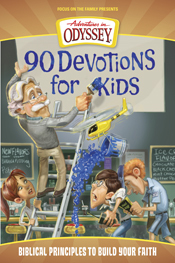 All of the devotions have themes, challenges, memory verses, and activities to keep the kids engaged and walking out what they learn in the devotionals. I know a few kids at the proper age that will benefit from my gift. I just wish the book would give the age appropriateness.